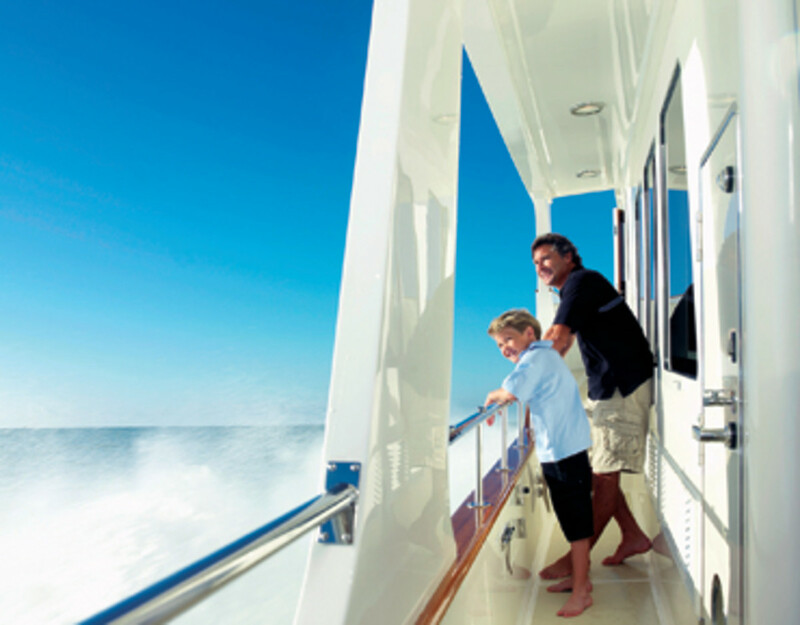 No matter how you dice it, the data is clear: Boat buyers are getting older at a rate that’s outpacing overall aging in America. 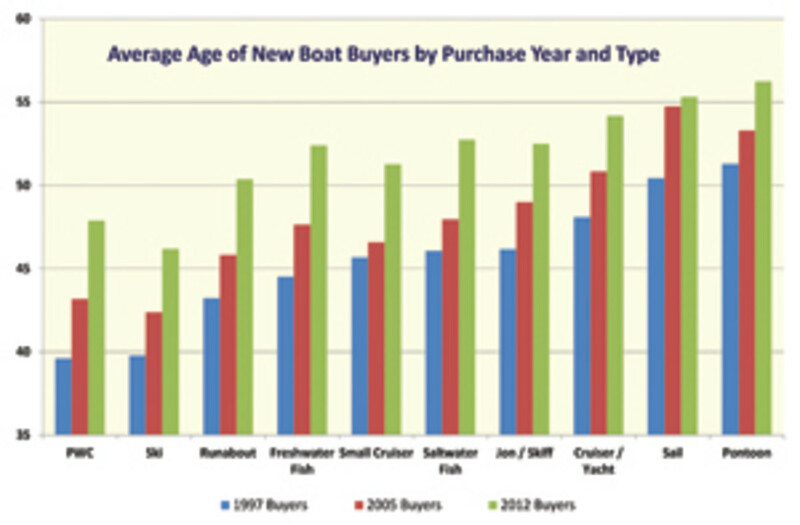 And that’s not just new-boat buyers. 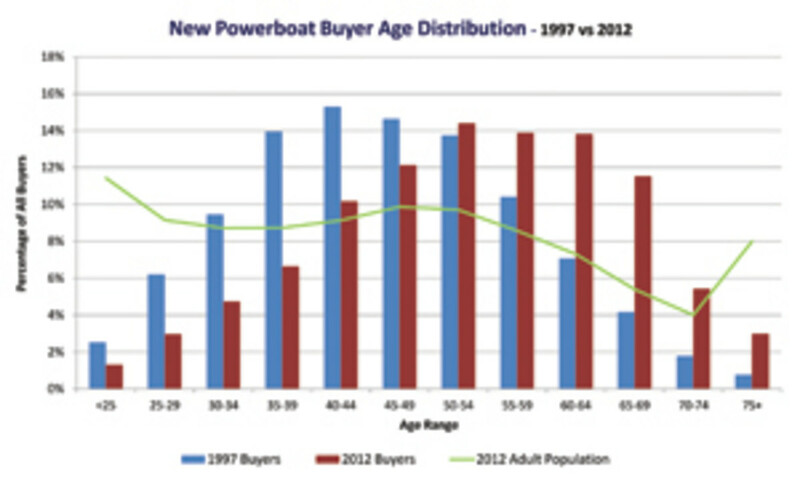 Used-boat buyers also are aging, albeit not as quickly. Since 1997, the age of the average new-boat buyer has increased from 45 to 53, says Jack Ellis, of Miami-based Info-Link, a company that tracks sales data for the boating industry. “It’s not like there was this sudden shift. It’s just a constant.” During the past 15 years, the percentage of new-boat buyers under 40 has shrunk by half — from a third to 16 percent, says Ellis. The aging baby boomers have made a ripe target for boatbuilders. It’s one of the largest generations in U.S. history, the group is reaching or already has reached retirement age and has the time to boat, and boomers more often have the means to afford a new boat. But Ellis cautions against ignoring the larger implications. Part of the emphasis on the boomers can probably be chalked up to the fact that the generation following the massive group of boomers, generation X, is relatively small by comparison. Combine that with a prolonged economic downturn, and it makes sense that this group would be challenged to invest in a boat. But subsequent to the gen-Xers is generation Y, or the millennials, which is another huge group of people and one that some boatbuilders are already trying to reach. Bryant Boats president John Dorton recently partnered with a design college to task a class of millennials who were students there to come up with the next generation of boats. The feedback was overwhelmingly clear, Dorton says: Their parents’ boat will just not do (see accompanying story). Constantine says he likes the fact that some of the larger builders are trying to offer boat packages that include engines and trailers for less than $20,000. Notable in this group is the Bayliner Element, which targets younger buyers, as well as those in other age demographics with limited discretionary money, says Brad Anderson, vice president of marketing and planning for Brunswick’s fiberglass recreational group, which includes Bayliner, Meridian and Sea Ray. “If cost is prohibiting some users, regardless of demographic, the Bayliner Element’s a great example of giving customers an option for $13,999 or less, fully outfitted, and $150-per-month payments or less with zero down. It allows people to participate in that boating lifestyle at a very economical price,” says Anderson. The increasing age of buyers could be affecting the uneven recovery among various segments. “The aging of the boater has affected every segment of the industry, but some more so than others,” Ellis says. Anderson says that historically pontoons have resonated well with boomers. “At the same time, you have a lot of younger people moving into the category,” he says, especially with the advent of higher horsepower engines on those boats and innovations such as triple tubes. Given price points that range from $18,000 to $100,000 and the large range of performance characteristics, their appeal stretches across age groups, Anderson says. Many Back Cove buyers are boomers shifting away from sail because they no longer want to handle a sailboat, Constantine says. “They’re drawn to the Down East design because it’s classic and more like what they’re used to,” he says. The rest tend to be boomers who have owned boats for a decade-plus. Constantine is not alone. On the days they worked, 36 percent of employed people age 25 and older with a bachelor’s degree or higher did some work at home, according to a Bureau of Labor Statistics time-use survey. A Good Technology survey from 2012 shows the average American puts in more than a month and a half of overtime a year just by answering calls and emails at home. It also found that more than 80 percent of people continue working after leaving the office — an average of seven extra hours a week. That’s a total of close to 30 hours a month or 365 extra hours every year. Almquist calls herself a demographic anomaly. “I raised a teenager in my 30s and [am now raising] a toddler in my 40s,” she says. But her situation is increasingly common as more families become less traditional. Baby boomers have “short-term” or “immediate” potential for boatbuilders, depending on whom you ask. The population aged 45 to 64 grew at a rate of 31.5 percent, Census Bureau data showed. The population aged 65 and over also grew at a faster rate, 15.1 percent, than the population under age 45.